This data set provides a 27-year land cover time series of 28.5-m resolution products derived from Landsat images for 80% of Rondonia, Brazil, for the period 1984 to 2010. Selected Landsat Thematic Mapper (TM) and Landsat Multispectral Scanner (MSS) images from the years 1984 through 2010, for seven path/row scenes (PortoVelho, Ariquemes, Jiparana, Luiza (or Urupa), Cacoal, Chapuingaia, and Vilhena) were mosaicked for each year. Each mosaicked image was georectified and classified into seven land-cover classes--savanna/rock, pasture, secondary forest, primary forest, cloud, urban, or water. This 27-year time series allows the long-term assessment of land-cover variation across the state. There are 27 GeoTIFF image files (.tif) and one accompanying .xml file for each GeoTIFF file, compressed and available as *.zip files, one file for each year for the period 1984-2010, with this data set. Archived by National Aeronautics and Space Administration, U.S. Government, ORNL_DAAC. https://doi.org/10.3334/ORNLDAAC/1165. Roberts, D.A., M. Toomey, I. Numata, T.W. Biggs, J. Caviglia-Harris, M.A. Cochrane, C. Dewes, K.W. Holmes, R.L. Powell, C.M. Souza, and O.A. Chadwick. 2013. 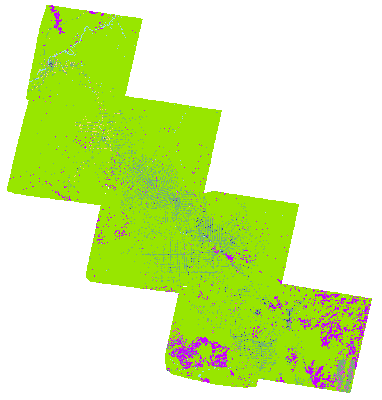 LBA-ECO ND-01 Landsat 28.5-m Land Cover Time Series, Rondonia, Brazil: 1984-2010. ORNL DAAC, Oak Ridge, Tennessee, USA. http://dx.doi.org/10.3334/ORNLDAAC/1165.